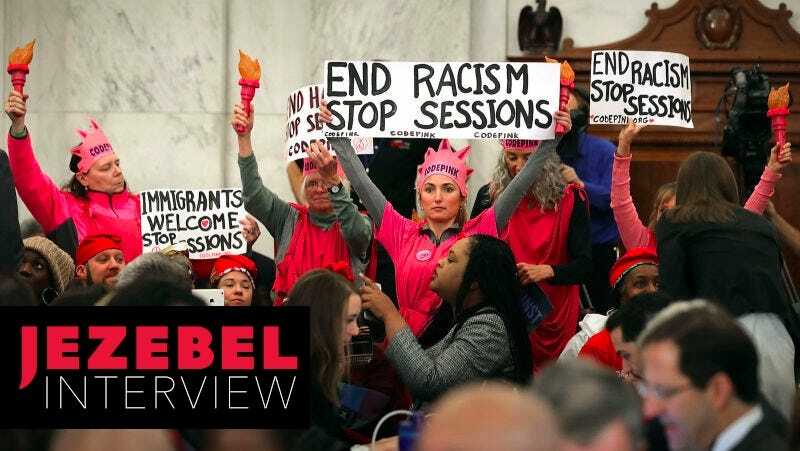 Image of Code Pink protesters at Russell Senate Office Building on January 10, 2017 before the start of Sessions hearing. Image via Getty. On Wednesday, a jury found 61-year-old Desiree Fairooz guilty on two charges of unlawful parading and disorderly conduct after she was arrested for laughing during a Jan. 10 confirmation hearing for then-Alabama Sen. Jeff Sessions. She, along with two other protesters arrested at the hearing, face up to one year in jail and a $2,000 fine each. The verdict was decided by a jury after a two-day trial in Washington, DC and has attracted national attention as a referendum on the limits of free speech and dissent under the Trump administration. Fairooz and the two other protesters, Tighe Barry and Lenny Bianchi, belong to Code Pink, a woman-led activist group that formed in opposition to the Iraq War under the Bush era and frequently stages protests against politicians. The day after the verdict was delivered, Fairooz talked to Jezebel about her reaction and how she’s fighting back. Describe the moments immediately before and after your arrest. My colleagues, co-defendants Tighe Barry and Lenny Bianchi had been removed, so I was worried about what was happening to them. Were they just being ejected? Were they being arrested? Were they being handcuffed? That was really what I was thinking about at the time. It was a chaotic situation in that room until the gavel went down, which was around this time, and so people started to settle. And then senators were starting to talk about why Jeff Sessions qualifies for this position. This man in no shape or form deserves to be our attorney general and it was very frightening. So when Sen. Shelby said something to the effect of [Sessions] would defend all Americans, I found that statement ridiculous. It was absurd, because his history shows otherwise. At that point, I could not hold in my chortle. I just thought it was crazy. I don’t regret having laughed. At the moment, I didn’t think anything was going to happen. Then a few seconds passed and then a young officer comes over to me and she says, “Come with me, ma’am,” and I said, “Why? I’m going to be quiet,” and she called over other officers and she tried to physically lift me and I was refusing to go. At that point, that’s when they created disturbance by bringing over other police officers. I was charged with parading, but they paraded me. It was maddening. I was upset at that point and I thought this was unjust and that they were just making an example of me. And then I thought well, they’re going to arrest me, I might as well have my message up while they do so. And that’s when I held the sign. I was angry. Code Pink member Desiree Anita Ali-Fairooz confronts Secretary of State Condoleezza Rice on October 24, 2007 in Washington. Image via AP. What was your reaction to the verdict? Initially, I think I was dumbfounded at the decision to find us guilty and the charges that they chose to find us guilty for. It seems to me that the jury is confused about how this works. We think that maybe they didn’t understand the jury’s instructions. And convicting us for what happened after the arrest is totally wrong. They’re not supposed to take into consideration what happens after the decision was made to arrest us. Are you planning to fight this, and, if so, how? Well, the interesting part about this is that the judge has recommended, or kind of intimated, that our lawyers should give themselves lots of time before sentencing and so our attorneys think—these are court appointed attorneys—think that that means he’s suggesting that they file motions to have the judgment vacated, overturning the decision of the jury. So we feel that there is a possibility that our attorneys will fight this. It’s not a technical appeal but we’ll fight this by making motions that errors were made in the trial. That’s what we’re hoping for. If that does not come about, then we’re hoping for a lenient sentencing, because we think that the prosecution misled the jury in allowing them to believe that they could find us guilty for actions that happened after the arrest. And the arrest was something that even the jurors admit we shouldn’t have been arrested for. I shouldn’t have been arrested for laughter. Nor should my co-defendants been arrested for something that happened prior to the commencement of a hearing. So they admit that, we’re just wondering: what should happen next? We’re hoping that our legal team and the judge will side with us and correct this erroneous procedure. How has this experience affected your activism? Well, some people are more concerned than I am about it. I am hoping and believing positively that justice will prevail and that I will not have to serve any time for laughing in this congressional hearing. At the same time, we have to be realistic under a Trump administration—we’re not sure, is there going to be pressure placed on the judge? Is there going to be pressure placed on our legal team to not do anything above and beyond the normal, to let us be examples for other activists? A measure to squash dissent. We are seeing, around the country, measures being taken by local and state politicians and some of our representatives—I think only Republicans—are initiating legislation to limit protest. That is a concern and it doesn’t mean that I’m going to stop speaking out against injustice, but it is worrisome. Fortunately, with the help of my partner I was able to retire and we are passionate about being the voice for those who cannot speak for themselves and we’re not going to stop doing that just because our government tries to silence us. How did you get involved with Code Pink? I used to be a working mom in Arlington, Texas and during the Bush era, I was extremely upset and distraught about the wars that the former president decided to take this country to and was searching for organizations or people to whom I could gather and find support and find some answers to my questions about what we should be doing around this issue. That was back in 2003 and at the time, there were no groups in my area and so I was online searching and searching and I finally found an image online of some women vigiling at the White House in pink. I remember it being a little thumbnail image and oh, I want to find out who that is. I went to their website and found out there was a chapter in Fort Worth, which is the next town over. There was a one person chapter and we started raising funds by selling cookies and attending events and from there, in 2005, I was at the Veterans for Peace conference that happened to be in Dallas, and met Cindy Sheehan and listened to her speak. When Cindy Sheehan put out a call: who’s going to go down with me to the Southern White House to where Bush vacationed, in Crawford, Texas? I said I’m going. I took emergency leave from my work and followed Cindy Sheehan to what is now known as Camp Casey, and we camped out. I spent more than a week at Camp Casey. Code Pink got involved with Camp Casey, coming down to assist Cindy Sheehan, whose son was killed in Iraq, to set up press for her. 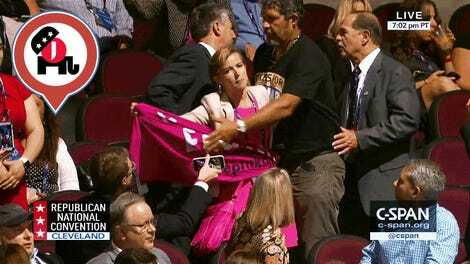 That was my beginning with Code Pink. Have you been arrested before for previous protest actions? Yes, I have been arrested on Capitol Hill probably seven or eight times in that time frame. Was this arrest any different from those other times? Well, I wasn’t planning on getting arrested here. I have experienced some arrests where I wasn’t expecting to get arrested. It was another petty arrest, or a mistaken arrest. Once I was arrested for being on Capitol grounds when they said I had a stayaway in effect when indeed I hadn’t. So I have been arrested wrongly once before. But most of the other arrests, I knew that I was doing something that was potentially arrestable and I was willing to take that risk. I was arrested for confronting Condoleeza Rice in a hearing about foreign policy in Iraq, and I knew and I was willing to take that chance. This one was not warranted at all. I was not expecting to be arrested. I’ve attended many hearings where we’ve stood in the room with signs above our heads wearing costumes and the chairman of the committee allowed us to stay the entire time, virtually ignoring us. This case was so different because it seemed as if the decisions of the decorum allowed in the hearing was being made by rookie police officers, not by the committee chairman. Is there anything else you want to say about your arrest or the conviction? I’m just an average citizen. I’m no spokesperson. I’m no paid protester. I am a retired children’s librarian, former teacher who is speaking for people like my former students and their families or those who are not able to do this. That if you do not stand up to the injustices that are being imposed on us—I mean, I see our democracy crumbling every day. It was bad under Bush. It was definitely imperfect under Obama. And now every day, I ask myself, is it fascism now? And so if we don’t stand up while we still have some modicum of democracy, it’ll be too late. So if anything, I hope others feel inspired to do likewise.